Monty Graycat Ponders Out loud: I'm Baaaack! I am so so sorry for such a long break between posts! Us kitties have been very busy, and Mommy has been too! BUT! Now Mommy is done work for most of the summer, she will only work a few days a week now! So she will have lots more time to play ad snuggle with us, and of course blog more too! We have been keeping up with everyone, but mostly reading, and not commenting. There was a scary flood! The human litter box randomly decided to overflow! Luckily it was just water and nothing yucky, but it went half way down the long hall, and all the way into Mommy's room, and the other bedroom too! It was scary, and we didn't like having damp carpets fr the next few days! Mommy's tattoo is great! It looks real pretty, though I wanted to lick it! Her vegan all natural tattoo balm smells REALLY nice, but Mommy kept telling me NO LICKING! Mommy got a new roommate! Her name is Lisa, and she loves animals too! We like to play with her, and sleep on her bed, especially Lexy! She moved in mid June and so far her and Mommy get along really well. I realize I never explained what happened to Baby, but it is something scary and sad, so I will save it for a seperate post, maybe I will write it for right after this one! Toby is a very very sweet little boy. Sadly, he is just a foster kitten, and he leaves on Saturday to go get his shots, and then go to the scary cage place where I was, to find his forever home. We are all very sure that Toby will get a forever family really fast since he is such a cute, sweet, and playful little fellow! We sure will miss him though! Toby was one of a litter of kittens born to a poor Momma cat that someone dumped at a farm. The woman whose farm it was didn't know much about kitties, so she just let them live outside. The Momma cat started bringing the kittens prey she had caught, but the kittens were still very young, and a few got sick, so the lady called Animal Love Foundation, and the kittens got picked up. Toby was the very sickest, and was very very skinny. When he was found at the farm, he was trying to chew on the foot of a dead baby chipmunk! Yuck! "What should I pway wif next?" After Toby was a bit better, Mommy was asked if she wanted to foster a little kitten for a while, and of course she said YES YES YES YES! Mommy was told that the kitten was maybe 8 weeks, and was very skittish and a little scared of people. Well they were very wrong! The kitten (Who didn't have a name yet) was only just about 6 weeks old, and LOVES people! "I conquered da catnip ball!" At first, Toby would only sleep all day. He played a little bit, and would follow me everywhere, prancing along behind me, but he slept a LOT, more than even a kitten should, and kittens sleep lots! He wasn't eating, so Mommy tried mixing his wet food with kitten milk, but he wouldn't touch it. Then she tried just kitten milk, and he liked that, but it wasn't enough! Finally, Lisa and Mommy caught him stealing a bite of our big kitty food, and they thought "Hmm, maybe he just really doesn't like the wet food!" and they were right! He loves his kibbles! Toby was EXTREMELY skinny, you could feel every single bone really well, and when you rubbed his belly, you could feel his organs! Now that he is eating though, he has padding over his bones, and a little chubby belly! 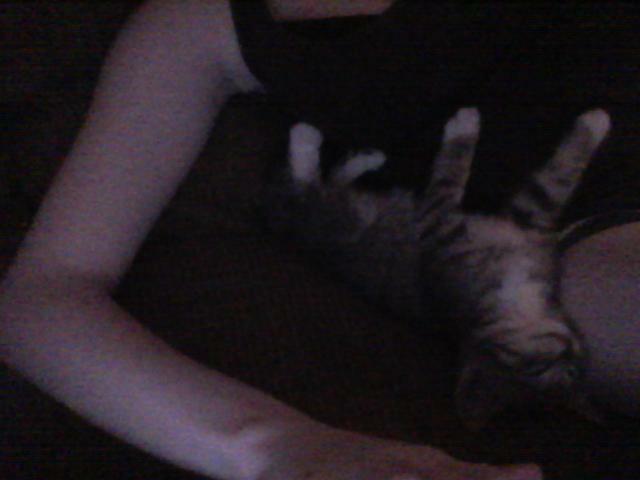 He is about 8 weeks old now, and Mommy says he is starting to look more like a little cat than a skinny tiny kitten! He can climb all the way to the very top of the cat tree! He is a little monkey! He has almost too much energy now! He LOVES to play with us! He even got LEXY to play with him! And Lexy really doesn't like to play with other kitties. 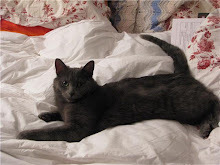 At first Sam was a little afraid of him, Lexy would hiss at him when he came near her, and I wasn't too sure about this little gray introoder following me around, taking up all Mommy and Lisa's attention, but now I really like him, and Sam and Lexy do too. We all groom him, from head to toe, and he purrs so loud when we do that! He also loves Mommy and Lisa too. He loves to snuggle, and have his now chubby belly rubbed! He even went into work with Mommy, and met the kids, and was great with them. He let them hold him and pet him and play with him. He went to Mommy's friend's apartment last night, and got to see her giant fish tank with her little puffer fish in it! He said it was really fun! "You smell like Sticky Little People!" Well, that sure was a LONG post for the first one back! I hope you didn't all forget about us, or miss us too much! I sure missed posting, but it was nice to have a little break! I PROMISE to finally tell you what happened to Mommy's old roommate Chris, and his kitty Baby later, and to post LOTS more this summer! Oh! 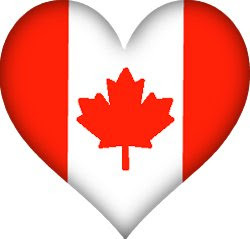 And to all our fellow Canadians, HAPPY CANADA DAY! Happy Canada Day from we Canadian cats--and human--too! And Toby is just a doll, a precious sweetie. We hope he finds his forever home very quickly!!! Hi...welcome back. Toby is a cutie pie. Love the tatoo too! Happy Canada Day to the bestest of neighbors. Hurrah! We're glad to see your post! You really DID have a lot of news...and sounds like there is more to tell...maybe Toby could stay with you? He sure seems to like ya'll a lot. Did you have to have strangers in the house to fix the toilet? We don't care for strangers, ourselves. They just don't smell right!